Prepare the bed before you buy the crowns to plant in late winter – early spring. Since this is a perennial crop which can last for up to 20 years it is well worth the effort of establishing properly. Asparagus needs good drainage and plentiful food and can be planted very successfully in a raised bed enriched with compost and well rotted manure. Seaweed is an excellent mulch. The crowns are planted in a trench, but with the roots straddling a ridge. Cover so dormant shoots are about 4cm below the surface. Do not harvest spears the first year, and only harvest for a few weeks the second year. Remember this is a long-term investment. 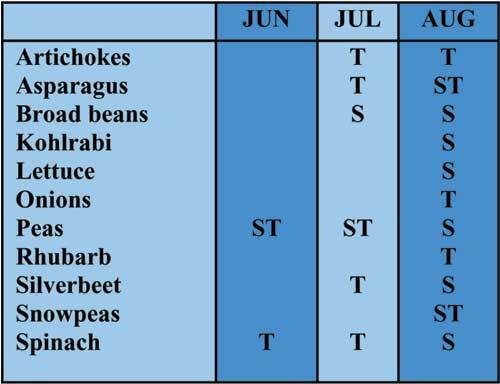 Late plantings of broad beans in June may be very slow to germinate. Better results are usually achieved with an autumn or early spring planting. Prepare the soil well with lots of organic matter. Needs rapid growth for flavour. Mid season varieties are often sown late autumn or early winter and long keeping varieties in winter. However, the timing of mid or late season varieties is well worth experimenting with by making successive plantings to determine the best time in your specific locality. Peas can be planted in August/September for an early summer crop but may be very slow to germinate if the ground is still very cold. This is a perennial but plants generally only produce well for a few years, then fresh plants need to be started from subdivided crowns planted in late winter or early spring. It is very hardy, but it is a gross feeder and will appreciate lots of compost or well rotted manure and plenty of water. Growers may wish to start a number of crops in late winter rather than early spring if the winter is mild or if they have a sheltered garden bed. These crops include artichokes (Globe and Jerusalem), beetroot, cabbage, carrots, potatoes and radish. Frost-sensitive vegetables such as capsicum, eggplant and tomatoes can be started early in August indoors but may need a heated glasshouse or warm spot to germinate and will certainly need protection before being planted out in spring. Plant certified stock or propagate from runners (not from plants more than 2 years old however) in a soil enriched with compost or well rotted manure. Remove old leaves and excess runners to tidy up the plants in winter. Raspberries, youngberries, boysenberries etc can be planted during winter while they are dormant. Remember these bear fruit on canes grown in the previous year so to prune remove all the old canes in autumn or winter making sure to leave the current seasons growth for next years fruit. Autumn fruiting raspberries bear on the current years growth so are cut to the ground in winter after they have fruited. Red, white or black currants are easy bushes to grow in Canberra as they withstand very cold weather and don’t mind heavy clay soil. Currants produce a fruit rarely available commercially. They need to be pruned in winter to remove dead wood and around a third of the oldest branches to encourage new growth and allow for good air circulation.